We’d love your help. 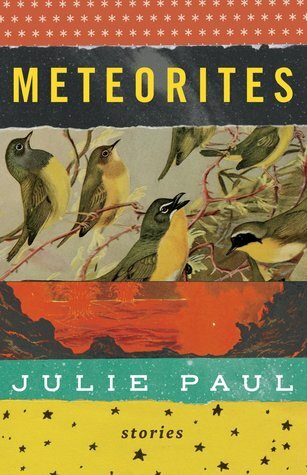 Let us know what’s wrong with this preview of Meteorites by Julie Paul. A young man takes his father to Hawaii, even though he's been dead for months. An organ player won't let her newly amputated arm stand in the way of Sunday duties. A grad student decides to take the fate of a homeless man into his own hands. A couple of A collection of captivating stories that explore family dynamics and frailty, loss and atonement, faith and redemption. To ask other readers questions about Meteorites, please sign up. I'm a writer in Victoria, BC, Canada. My fourth short story collection, Meteorites, is forthcoming in June 2019 (B &G). My first collection of poetry, The Rules of the Kingdom, was released by MQUP in 2017. My second book of short fiction, The Pull of the Moon, came out in 2014 (Brindle & Glass), and my first book, The Jealousy Bone, was released in February 2008 (Emdash Publishing). Work I'm a writer in Victoria, BC, Canada. My fourth short story collection, Meteorites, is forthcoming in June 2019 (B &G). My first collection of poetry, The Rules of the Kingdom, was released by MQUP in 2017. My second book of short fiction, The Pull of the Moon, came out in 2014 (Brindle & Glass), and my first book, The Jealousy Bone, was released in February 2008 (Emdash Publishing). Work of mine has appeared in the anthologies Coming Attractions 07 (Oberon Press) and Women Behaving Badly, as well as literary mags such as The Fiddlehead, Dalhousie Review, Geist and The Antigonish Review. A novel is underway, as well as more short fiction and a book of essays. Check out my site for links to reviews and other news.http://www.juliepaul.ca Thanks for stopping by.